Shs7b Drugs Destroyed In Kampala. 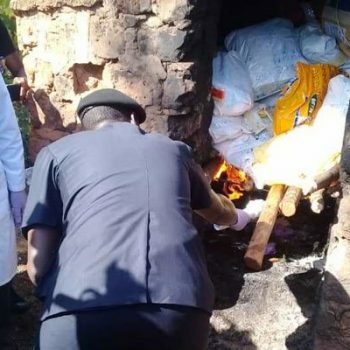 About 600 kilogrammes of narcotic drugs recovered from suspects by Ugandan authorities since 2015 have been destroyed at Nsambya Police Barracks in the capital Kampala. Before setting fire on the drugs, the Deputy Inspector General of Police Maj Gen Muzeyi Sabiiti on Thursday said they were valued at Shs7 billion. “At least 45 suspects were arrested and several convicted for smuggling drugs such cocaine, heroin and marijuana,” he said. He said drugs have a great negative impact on society. “HIV prevalence among drug abusers is at 17 percent, higher than the national prevalence of 6.8 percent. Drugs are transnational crimes and we must combine efforts to fight them,” he said. This is the second time Ugandan authorities are publicly destroying the illicit drugs in the last five years. In 2014, at Nsambya Police Barracks, Grace Akullo, the director of Criminal Investigations Directorate, vented her anger as 159.68 kilogrammes of narcotic drugs worth Shs109 billion were publicly destroyed. The drugs had been seized in 52 cases with drug traffickers at Entebbe Airport and other parts of the country in more than three years. But by the time the drugs were destroyed, none of the drug traffickers from whom they were seized was in jail – all had paid a total fine of Shs35m and marched to freedom. After the rise in cases of trafficking, in November 2015, government started implementing the Narcotic Drugs and Psychotropic Substances (NDPS) Act 2015, which gives harsher punishments to drug pushers and traffickers. In September 2018, Entebbe Magistrate’s Court sentenced Rodriguez Fagundez Albelys Doralys , a 24-year-old Venezuelan national to 22 years in prison for drug trafficking. Court also issued an immediate deportation order to Doralys after serving her sentence. Doralys was arrested on June 18, 2018, at Entebbe International Airport for possessing a total of 1,660gms of cocaine which she had swallowed. At the same time, the magistrate’s court fined Mr Adson Ampaire, an employee of Entebbe ground handling firm NAS, for conspiracy to airlift 8kgs of heroine at Entebbe airport. Mr Ampaire had hidden the cocaine in a staff van which was intercepted by the Civil Aviation Authority security. Laudato Nassimo, 37, an Italian was arrested on March 4 while Antonio Manuel, 64, a Portuguese was arrested on March 9.